A smoky runway set the stage for Chinese brand SUNCUN, creating an ethereal, dreamlike atmosphere. Adults and children modelled the new collection ‘FUSHENG’, with dragon motifs, metallic embroidery, and mandarin collars evoking a sense of the East. Wavy wisps of hair artfully framed the face and lips were painted a ‘lucky’ red colour. Designer Yan Zhang integrated cultural elements with contemporary styling for FW19 using distinctive traditional features such as ornamental braiding, Chinese frog fastenings and Cheongsam silhouettes. Smiling children clad in silk slippers brought the collection to life, illustrating the lively and carefree aspects of childhood that have inspired Zhang this season. Boy’s looks featured tunics paired with silk pants and regal robes. Girls were fitted in whimsical gowns with soft flowing trains, shimmering fabrics, and ornate embellishments that glimmered in the light. Tulles with delicate hand beading and intricately embroidered appliqué showcased the incredible artisanal techniques of SUNCUN. The colour palette developed from inky blacks through to pastel pink and sage green, before flourishing into brilliant whites. Zhang offered a fresh perspective on womenswear with a striking black and white contrast dress featuring beaded bamboo designs. A young boy named King Singh walked the runway in a tailored two-piece featuring a bird motif, known as a strong symbol of good luck. King came to SUNCUN through the organization A Free Bird; a non-profit that provides children diagnosed with cancer a chance to explore their artistic passion. The finale featured a duet of traditional male Changshan tunics and robes, both crafted in lavish gold silk; a masterful ending to a dramatic showcase representing SUNCUN’s dedication to bringing Chinese culture and fashion together. Check out SUNCUN on instagram. Unique fabric manipulations, casual silhouettes, and creative colouring were brought to the forefront of the first show from Global Fashion Collective. 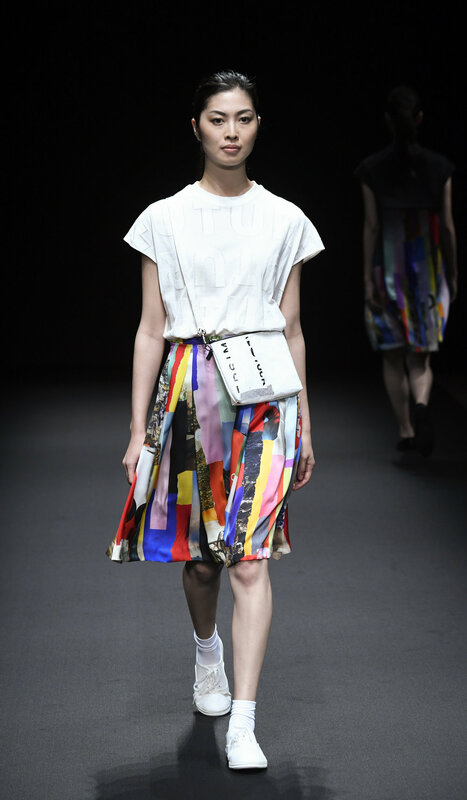 Three creative brands from around the world showcased emerging trends for the SS19 season on the Amazon Fashion Week Tokyo runway at Shibuya Hikarie Hall. First up, Atelier M/A showcased ‘Oneness’, their debut collection. ‘PAST’ and ‘FUTURE’ lettering spelled out the concept that ‘everything is one’, as Japanese designers Masato Koide and Azusa Koide presented a ‘coexistence of diversity’ by combining traditional hand sewing with digital print work and recycled plastics. A soft polka dot motif and colourful patterns created from strips, gave a beautiful naive style. Short-cut high-waisted pants worn over printed tights, lightweight raincoats, knitted jerseys, and sneakers made for casual styling. A key look- a grey checked suit with white contrast polka dots, worn with silver brogues made a slick and stylish statement. A wearable yet creative line, the collection drew attention to the designers intuitive approach to design. Next, U.S brand The House of AmZ presented a collection fragmented into capsules: Winter, Neutral, Lotus, Blush, Amalgamation, and Finale. Each capsule developed the concept ‘Self_ An Amalgamation’, reflecting the various emotions and responses to situations as we bloom into ourselves and grow, not unlike the way of the Lotus flower. Designer Alexandra Marie Zofcin utilised fabric manipulations to create shape, with pleats, gathers, and woven strips forming the silhouettes. A selective colour palette of sage green, beige, pastel pink, navy, cream, grey, and burgundy enhanced feminine cuts. A delicate raffia gilet overlay added texture, and beautiful Shantung fabric, iridescent in colour, beautifully caught the light. German designer Annika Klaas brought shades of sunshine for Spring/Summer with monochromatic collection ‘Jaune’. In different tones of yellow, textured knits were folded, pinched, and pleated to create structured looks. The painterly palette crossed from brazen canary to lighter lemon with soft matching bags and knitted-in pockets adding dimension. A seamless collection, Annika developed a new production technique by imagining a digital knitting machine as a 3D printer. A wrap over skirt in a warmer tone, was paired with a strapless top with large loose pleats creating a soft and natural form. The second presentation of Global Fashion Collective at Shibuya Hikarie Hall highlighted an artistic expression, with edgy, feminine and quirky styles for Spring Summer 2019 presented by three North American designers. EmulEos packed a punch to start off the evening, with models full of attitude sporting diamond encrusted boxing gloves and visors. North Carolina designer Emily Prozinksi was inspired by female boxers for collection ‘Tougher Than Diamonds’. Silvers and shades of black dominated throughout with oversized hoods, metal chainwork, studded boots, and faux snakeskin creating an edgy style. Diamonds and beading glistened under the light, while chiffon and georgette shimmered at the slightest movement. A key look featured mid-length balloon pants with a grey zip-up jacket, with silver chains adorning an oversized hood. Alicia Perrillo brought a whimsical colour palette and feminine gowns to the runway with collection ‘Sans’. Techniques such as painting, beading, crochet, and embroidery paid homage to the Chicago based designer’s late grandmother. A soft muted colour palette in lavender, periwinkle, dove grey, pale pink, gold, white, and black graced figure-flattering dresses, enhanced with beading detail, smudges of gold, and black floral appliqué. A white long sleeve fishtail dress with soft pink painted effect and pale blue frills was accessorized with handmade tassel earrings. Asymmetric hemlines and layers of ruffles created shape across the line. The showpiece- pale layers of sheer over a full-length gown with shoulder cutouts and long flowing sleeves, complete with tiara and veil making a strong feminine statement. Quirky printwork by Canadian designer GRANDI brought a fun feel for Spring/Summer 19. ‘PRISMANIA’ a demi-couture collection featured a pop art interpretation of the chinoiserie decor style with a large scale surrealist graphic print incorporating bananas, leaves, and donuts. Colour blocking broke up the pieces with bold yellow, blues, greens, and pinks, and dramatic eyewear by Black Iris with tassles and embellishments completed the looks. Classic cuts in A-line skirts, cigarette pants, and fitted jackets made for stylish wearable pieces. A key look featured a silk strapless dress with fitted bodice worn over a printed shirt with contrast cuffs and collar, showcasing designer Grandy’s eye for styling. An artistic collection to close the shows. Photos by Arun Nevader for Getty Images. 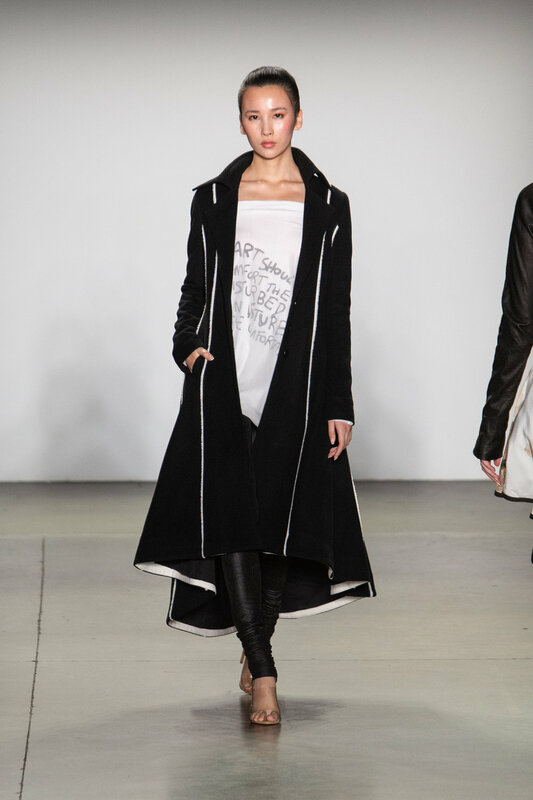 Australian brand Ozlana presented their much-anticipated new collection DREAM STILL____ at New York Fashion Week. An edgy yet romantic take on street couture, the new collection highlighted their experimental textiles, quality fabrics, and sustainable artisan techniques. 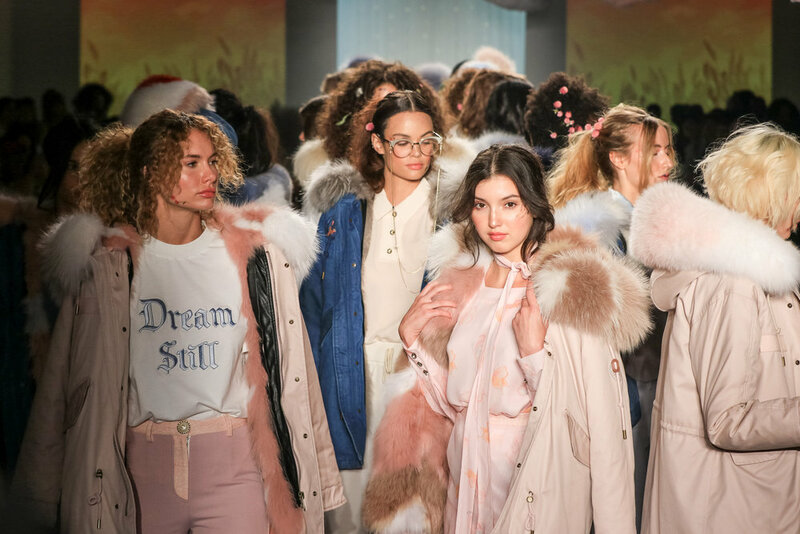 The mood at the runway was serene, with a naturalistic set design featuring dried wildflowers and pampas grass, soft fur overlays, and lightweight cloud props hanging from the air, illuminated in soft hues. The sound of chirping birds and projected moving scenes of waves and stars created an immersive experience, as if within nature, in the heart of midtown New York. DREAM STILL____ translates a tale of nostalgia as a woman builds her life in the city, recalling her beautiful countryside youth, and lapsing into a sweet recollection of what has been. Presenting an All Seasons collection, and subverting the traditional fashion calendar, OZLANA brings a new moment to their audience, combining highly wearable, practical fashion with an idealistic, dreamy mood. 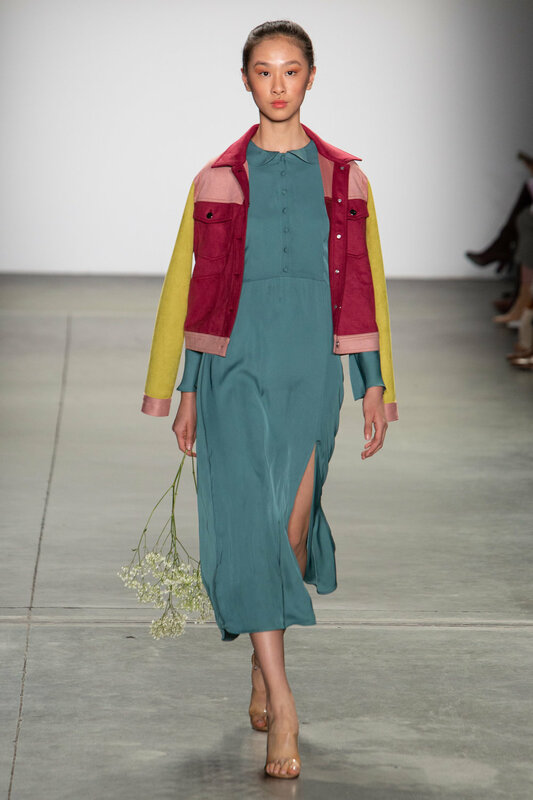 Designer Hannah Kim has created a casual and lux style with light feminine dresses in satin and chiffons, leather bomber jackets, and coloured fur gilets. ﻿DREAM STILL____ is a carefully developed collection, flowing effortlessly through a series of colourways transitioning from pretty pinks, baby blues and beiges, to black. Looks were layered, showing combinations of pieces. A strawberry motif embroidered on a long length knitted cardigan worn with a cherry print dress was accented by a red handbag and red sunnies for a cute look. A floral print pink dress with ruffled hem and cuffs oozed femininity. Glints of metallic embellishments lifted the soft pastel palette, with beaded embroidery, delicate hanging eyeglass chains, and silver heels. Fun accessories gave a youthful feel, with mini handbags, complete with fur trimmed handles - a hint of the classic Ozlana aesthetic. Shoe options included clean white platform sneakers worn with transparent sheer socks, and pale pink gold buckled mules lined with fur. Models were styled with a certain girlishness, with floral face tattoos and textured teased hair in high ponytails. The grand finale featured every model returning to the runway sporting a fur parka, Ozlana’s signature item. 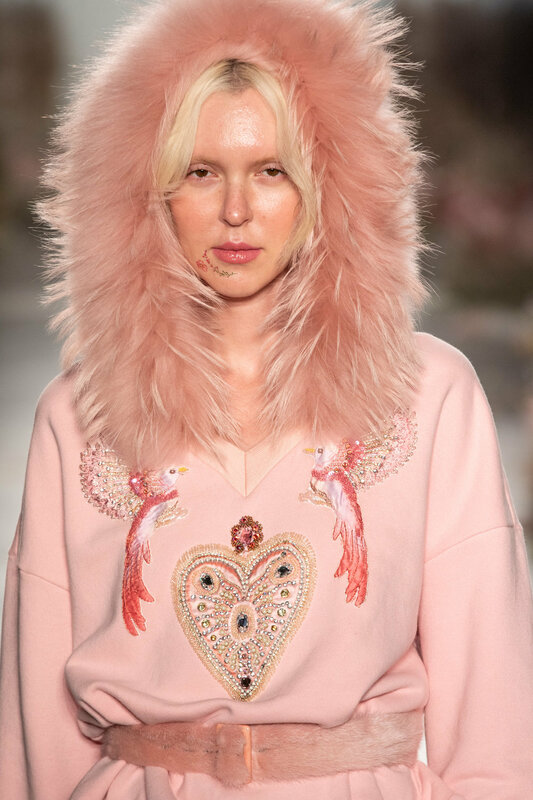 Plush fur-lined hoods in a multitude of colourways gave the wearer an expression of individual personality. So cozy, so covetable! Dreamy romantic undertones came through a modern, youthful, wearable collection where traditional Spring/Summer & Autumn/Winter looks are effortlessly merged. For the GFC II presentation, modern, sculptural and avant-garde collections featuring powerful feminine silhouettes blurred the line between haute couture and ready-to-wear fashion. First up, Chinese brand XY wowed the audience with a child model full of personality walking the runway wearing a towering traditional silver headdress. Inspired by ethnic Chinese cultures with a focus on the Miao people, designer Han Zhang fuses tradition with modernity using Chinese embroidery and contemporary fashion silhouettes. 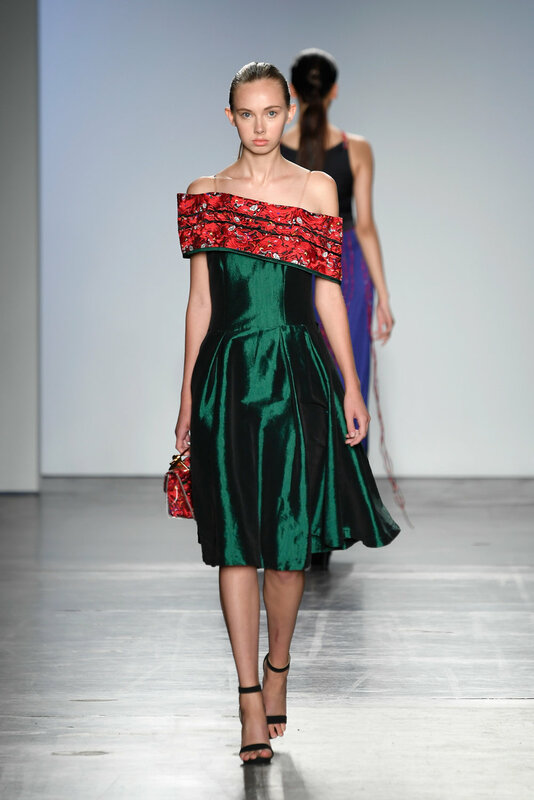 A selective palette of black, accent red, and green reigns throughout in sumptuous silks and textured tulle. An emerald coloured mid-length silk dress, with fitted waist and princess-line bodice featured a beautiful contrast red off-shoulder design. A dramatic silhouette was created with a model wearing large black angel wings. Canadian designer Kirsten Ley’s refined artistic approach to design shone through her new collection MITØSIS, about the division of self; a conscious choice to leave one version in the past while moving forward with the new version. Oxygenated crimsons, rich dark blues, and bone colours from the human circulatory system are paired with unusual and beautiful graphic printwork of anatomy diagrams incorporating florals. A stand out look- a two piece in crimson leather with sculptured shoulders and high neckline, complete with white voluminous fur sleeve coverings. Hand-gathered chiffon and billowing silks build the story. Resort collection TERRA by American designer Carlton Jones celebrates the cross pollination of global terrains taking inspiration from fresh Eastern silhouettes. Lightweight breezy natural fibres are layered over one another and feature beautiful printwork morphing abstract vertebrae into chic animal print, reminiscent of African safari. Sparkling shiny fabrics caught the light on the runway, with sequins shimmering in earthy tones of sand, referencing glamorous desert nights. A clean crisp white jumpsuit with long open flowing asymmetric sleeve created a sophisticated chic look. A group show with a real mix of design aesthetics, GFC I designers brought their vibrant and eccentric collections to the runway by taking exaggerated shapes and unique fabrics to the next level. Profanity By LillzKillz showcased a playful unisex collection ‘Eat my shorts’, with transparent vinyl pockets filled with toy cars, platform sneakers, video game prints, and bold bright colourways in vibrant yellow, tangerine orange, royal blue, and neon green. Old car parts including seatbelts, and seat leather are refurbished in garments nodding to the inspiration of a middle class family and their beat up car. A key look for this Canadian designer featured a teal and tan brown leather patched two piece with contrast white straps, topped off with a car seat headrest. 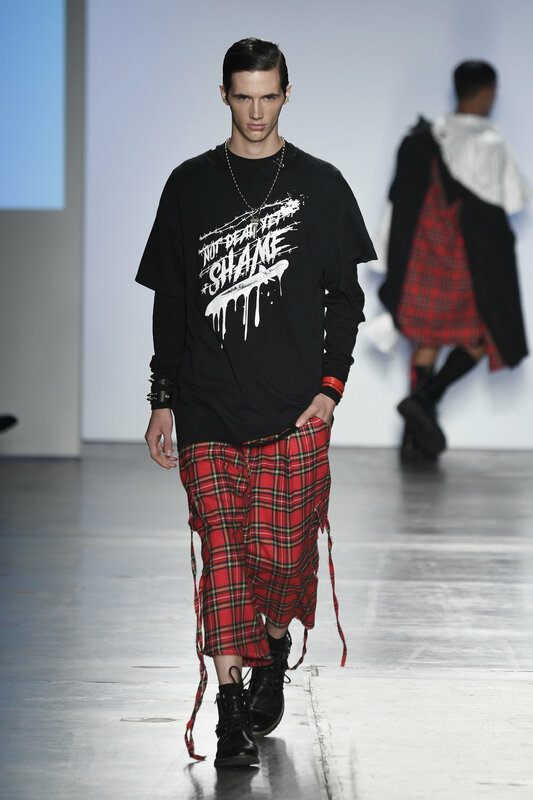 Plain black with contrast red and yellow plaid featured next for Canadian designer Adam Lin-Bungag, winner of the 2018 Nancy Mak Award. The NOT DEAD YET signature grunge aesthetic was expressed through oversized sleeves, raw edges, Dr Martens, hanging chains, and studs. Drawn letters spell out SHAME on the side of sneakers, and printed words on graphic tees hint at the theme ‘Eulogy’- the understanding that in order to move forward we must acknowledge, understand, and learn from our past. Highlights included a transparent PVC layer overcoat lined with over a red plaid jacket, and white crinkled pants with red plaid strips tied around leg. Rainbow shaved ice, tropical fruits, and flowers have inspired the 'VaCaTioN in Hawaii' collection by Japanese designer Nozomi Kuwahara for the SS19 season. Nozomi uses vivid colours, soft textured fabrics such as cotton Seersucker, and even SPF50+ fabrics to experiment with the summer theme. German designer Kim Tiziana Rottmüller leads us through a spiritual story for collection ‘Oblivion’, taking inspiration from a seductive witch, a symbol for our transcendental self and inner magical power. Lilac, the colour for spirituality brings light into the collection whereas black is used to submit the unknown, mysterious darkness. Experiments with volume are revealed through oversized hoods and layers of ruffles. A stand out look - a candy pink oversized woolen jumper embellished with mysterious tarot cards that weave in and out of the knit. On Thursday the 8th February at New York Fashion Week, an eclectic mix of emerging designers from across the globe were brought together to form a collective with real impact. Global Fashion Collective (GFC) a project by Vancouver Fashion Week (VFW), presented two creative and stimulating showcases at Industria NYC, 775 Washington Street, a large whitewashed studio filled with light nestled in the Meatpacking District. GFC began proceedings with the ‘Prêt-à-porter’ show, a refined ready-to-wear presentation with trendsetting new collections for the F/W 18 season, highlighting wearable and high-end takes on shape, fabric, and colour. First up, FICTION TOKYO, a brand by Japanese designer Monaca Nishi. A seductive saxophone medley played out as models clad in black bunny-ear masks paced the runway. Monaca took a retro spin for her collection ‘Favorite Heroine’ drawing inspiration from the lead of a childhood movie. A fun and feminine feel was given prominence with high-waisted leather shorts, flared sleeves, and silky fabrics. A subtle colour palette with soft pinks, khaki, grey, burgundy, and yellow was mixed. A stand-out look: soft knitted flared pants paired with a cropped fluffy sweater in pale pink with black crinkled bodice. Vancouver designer Melissa Yin showcased flattering cuts with her leather-based brand, presenting ‘Nine to Five’- a collection of fashion-forward pieces to take you from day to night. Bright lipstick red leather was contrasted with cream and black shades in fitted silhouettes. An elegant full-length black dress with short-capped sleeves and a cinched-in waist formed a striking look. An inspiring attention to detail was shown with silver star-shaped zippers and rhinestone trim which beautifully caught the light. Next in the line-up was Caroline Ann, a U.S designer from Atlanta, who draws inspiration from fond childhood memories. The concepts of time and nostalgia have informed the clothes, exploring summer days spent at the beach. 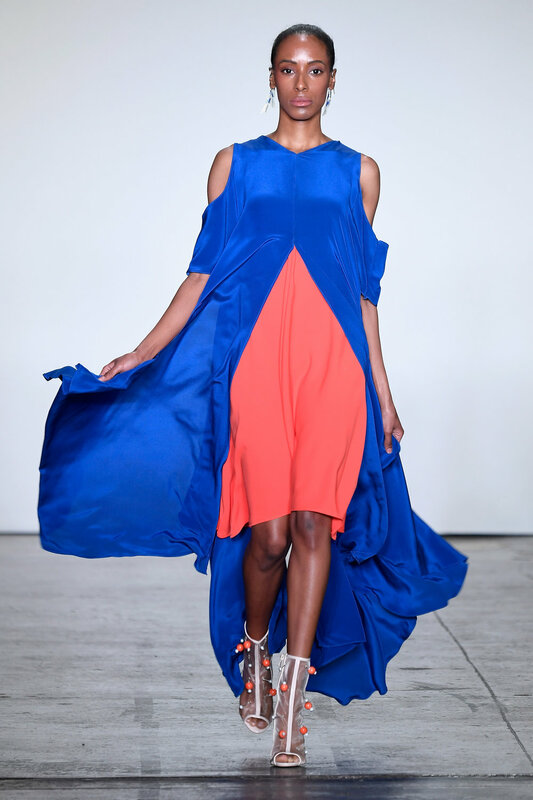 A collection geared towards the mild winters of the southern US with a fun touch of summer, we saw a vibrant palette of jewel pink, bold blue, and orange in light loose dresses and two pieces. Clever cutting and layering allows for pops of bright colour meshed with muted greys and an accent of print. Soft ruffles are inspired by the natural texture of sand dunes after being blown in the wind, and embellishments to suggest the sparkle of crushed up seashells are strategically placed throughout. Japanese brand WILDFRÄULEIN71 put forward a unisex collection inspired by the strong but transient beauty of a woman with a courageous man by her side. Designer Roop Shimura brought a more artisanal feel to the collective show, looking into the conceptual relationship between energy and form. An eclectic mix of colour and texture, layered outfits were pieced together with matte and shiny textures in autumnal shades. A highlight was a yellow knitted button up dress paired with a belted red check jacket; a green pageboy hat completed the look. Painted glass art pieces were carried by the models, who at the end of the runway, pointed to the sky, and announced their names and where they are from. An expressive presentation to close the show. The second showcase of Global Fashion Collective presented the work of progressive cutting-edge designers. Their experimental F/W 18 collections create powerful messages by the influence of personal and artistic expression. ‘Conceptual Artistry’ is an avant-garde selection of conceptual work with an haute couture feel. Canadian designer Kirsten Ley’s eponymous label features designs carefully crafted with a deep consciousness embracing the natural female form. The artistic collection NERŌ explores the concept of abandoning the fear of death and yearning for the afterlife. NERŌ highlights the exquisite and undeniable dichotomy of beauty and destruction with hard and soft surfaces in the collection’s textiles. A dark feminine energy was expressed with deep greens and inky blacks. The interplay between sculptured leather pieces and ruffled textile manipulations was balanced with fitted midi skirts and straight leg pants. A long length jacket with zip-up fitted leather bodice and sizeable fur sleeves made a bold statement. German designer Kim Tiziana Rottmüller’s signature is provocation in a feminine but playful way. The collection BITTERSWEET is a fusion of the concepts ‘Prison’ and ‘Barbie’. The designs are an artistic interpretation of a person wishing to break free from mental constriction, looking to the invisible prisons that exist only in people's minds. Volume and shape have influenced the designs, with oversized cylinders adorning the sleeves and an iron skirt to represent 'the cage'. A collection with impact, there was dramatic contrast in the large solid shapes and soft knitted textures. A minimal colour combination of black and pale pink symbolizes the aspects bitter and sweet. To end the show with a bang, the sound of military drums blasted through the space. 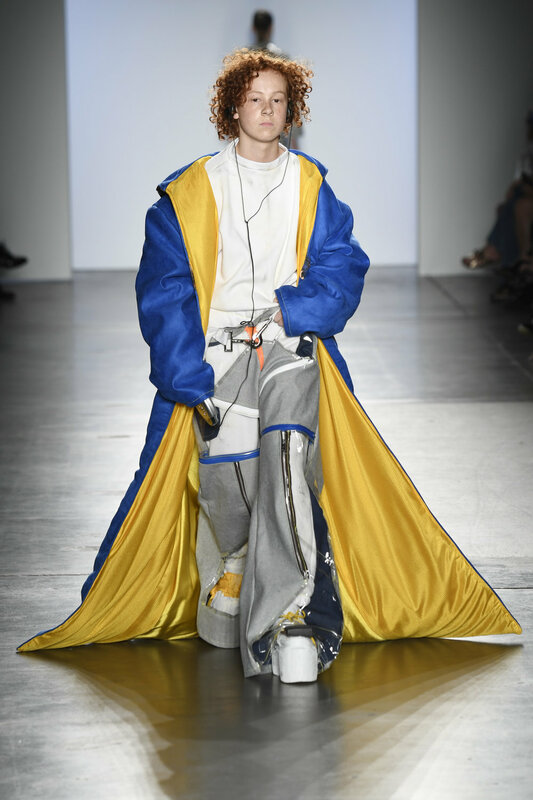 NiuNiu Chou of Chinese brand MRHUA MRSHUA presented a feast for the eyes with the ‘Vintage Soldier’ collection, a Military styled colour collision with Pop Art fabric dyeing. Fitted tailored pieces adorned with lace, tassels, and embroidery, featured unique patterns and vibrant clashing colours. Gold buckles, plaited aiguillette rope, and toy soldier hats invoked feelings of playfulness. A salute to psychedelic soldiers, a strong collection with brilliant visual appeal. Photos by Arun Nevader/Getty Images for Global Fashion Collective.